Stamping with Julie Gearinger: ODBDSLC282 Reminder- Winter Happy Birthday! 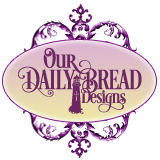 Just a reminder that it is not too late to join in with us for the Our Daily Bread Designs Shining the Light ODBDSLC282 Color Challenge! Don’t forget- you have until Friday, February 3, 2017 to join us for a chance to be spotlighted for the Shining the Light award or to win a $15 ODBD gift certificate (one random participant will be chosen). To be spotlighted for the Shining the Light Award, you must use ODBD stamps (or stamps from our sister companies: North Coast Creations or Artistic Outpost). I decided to create a Clean and Simple (CAS) card showcasing a sentiment from the January 2017 ODBD Release stamp set, Seeds of Today along with the new ODBD Whimsical Wildflowers Collection 6x6 Paper and ODBD Plum Pizzazz Collection 6x6 Paper as well as a few previously released ODBD Dies. I love the patterns of the paper in both of the new ODBD Paper Collections as well as the beautiful sayings and font on the sentiments from the ODBD Seeds of Today stamp set! I needed a winter birthday card and even though the ODBD Whimsical Wildflower Collection 6x6 Paper Pad is primarily floral, since this pattern was an overall swirled pattern, I thought that it would work with the snowflake, what do you think? 1). Ink the sentiment from the new ODBD Seeds of Today stamp set with blackberry ink, stamp onto white cardstock. Die cut and emboss with the ODBD Pennant Flag Dies and mount onto a piece of ODBD Plum Pizzazz Collection 6x6 Paper die cut and embossed with the ODBD Double Stitched Pennant Flag Dies. 2). Trim a piece of ODBD Whimsical Wildflowers Collection 6x6 Paper and mount onto the ODBD Plum Pizzazz Collection 6x6 Paper. Adhere the panel to a white card base. 3). Die cut and emboss a piece of ODBD Plum Pizzazz Collection 6x6 Paper and two pieces of white cardstock with the ODBD Snow Crystals Dies. 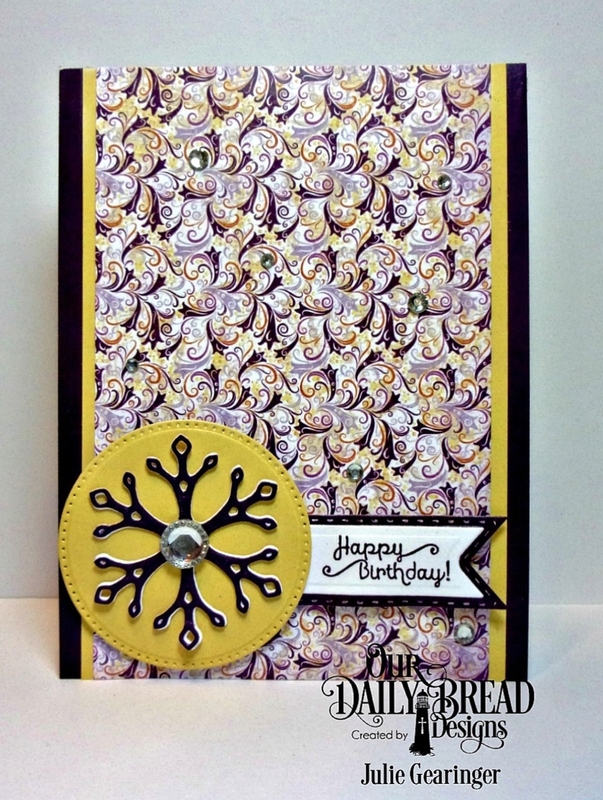 Layer the white die cuts with the plum snowflake on top. 4). Die cut and emboss a piece of soft yellow cardstock with the ODBD Pierced Circles Dies, mount the layered sentiment to the side of the circle and add both to the card front with dimensional foam. 5). Mount the die cut snowflake to the circle and add a rhinestone embellishment to the center. 6). Add a few rhinestones on the back panel to finish off the card. I am also linking this card to the Simon Says Wednesday “Winter Birthday” Challenge and the FUSION 3rd Anniversary Sketch Challenge. Thanks again for taking the time to stop by! 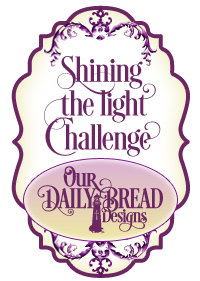 We hope you will be able to join us for the Our Daily Bread Designs Shining the Light ODBDSLC282 Color Challenge! Hugs and I hope you have a fabulous week, my friends! Julie, you always think of such different things to do with the products! Gosh...I think I have a one track mind and the wheels just WON'T leave the track!!! LOL! This is so different and very cool. I love the mirror finish snowflake and the big jewel in the center! Cool layout as well! I've never even heard of some of these other challenges that you and some of the girls do, dang. Blessings my sweet friend, hope things are doing good for you and your sweet hubby! What a gorgeous card, Julie!! I so love the metallic snowflake and your layout against the gorgeous dp!! 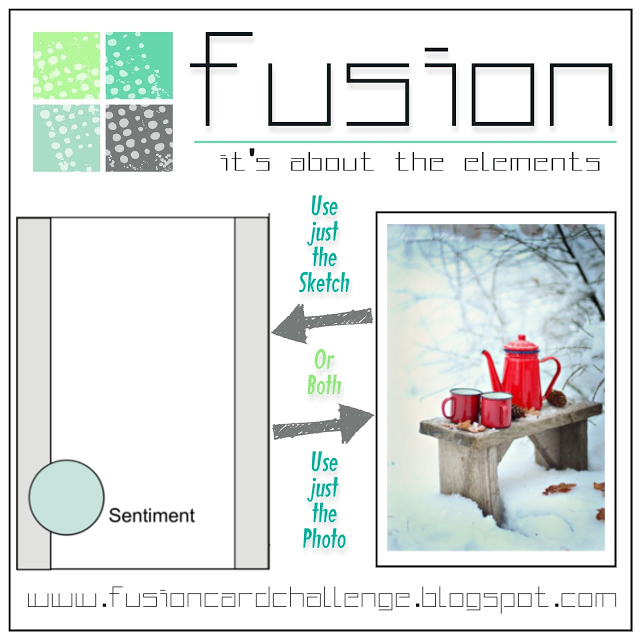 Stunning use of the color challenge. Love the snowflake against the golden yellow!! You are such an inspiration. That is one beautiful background! Beautiful card and I love that funky font! Glad you joined us at Fusion! Gorgeous card Julie! So glad you joined in the fun @ FUSION 3rd Anniversary!